Many graduated students are utilizing what they learned in the Waseda University School of Human Sciences to be active in a wide range of areas. 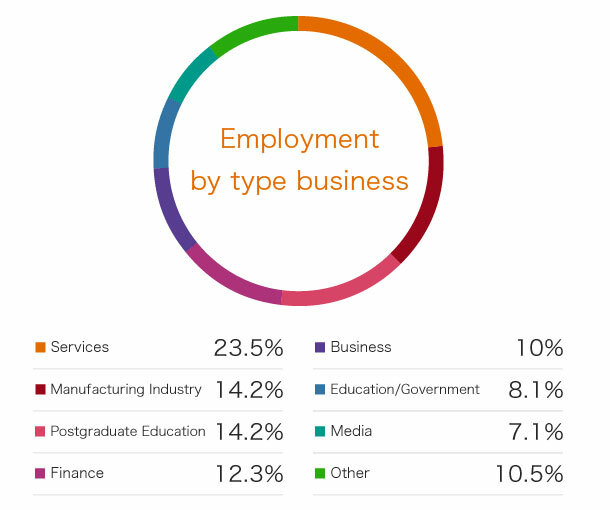 The following is a guide to employment results, further education and obtainable qualifications. The wide ranging fields of study and high degree of specialization studied and acquired in the School of Human Sciences cultivate human resources active in all areas. 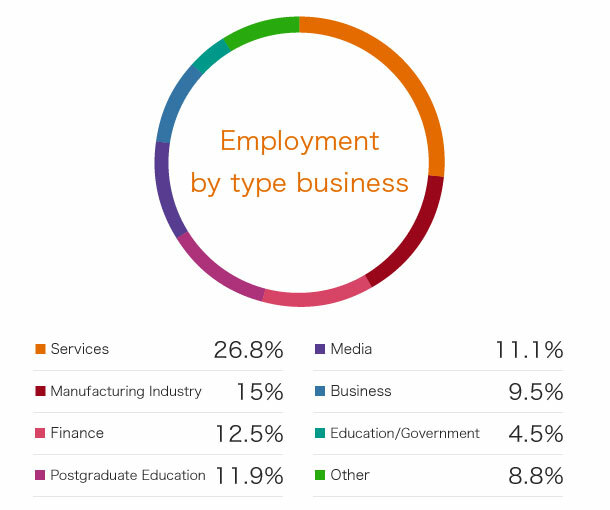 The future paths of graduates also cover a wide range of fields unlimited by industry. What kind of field do you want to be active in after graduation? Change your dream to goals that you realize and spend a fulfilling 4 years in the School of Human Sciences. 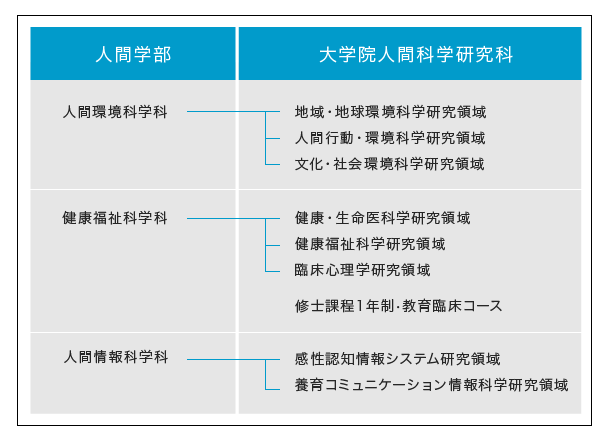 Dai Nippon Printing Co., Ltd., Rakuten Inc., East Japan Railway Company, Kajima Corporation, Mitsui & Co., Ltd., Shimadzu Corporation, Hitachi, Ltd., Sony Corporation, Asahi Breweries, Ltd., Shiseido Co., Ltd., Asahi Kasei Homes Corporation, Tokio Marine & Nichido Fire Insurance Co., Ltd., The Bank of Tokyo-Mitsubishi UFJ, Ltd., Mizuho Financial Group, Inc., Marubeni Corporation, Dentsu, Inc., Ryohin Keikaku Co., Ltd., Shogakukan-Shueisha Productions Co., Ltd., National Government Employee Class I (Ministry of Economy, Trade and Industry), TV Asahi Corporation, Recruit Co., Ltd.
Progressing to Graduate School to acquire a higher degree of specialist knowledge is one of the alternatives after graduation. It is possible to raise the level of the specialty you studied in the School of Human Sciences in the Graduate School of Human Sciences. The Graduate School of Human Sciences has developed research and education in 8 research areas (Regional and Global Environment Sciences, Human Behavior and Environment Sciences, Cultural and Social Environment Sciences, Health and Biomental Sciences, Social Welfare and Health Sciences, Clinical Psychology, Sensibility Cognition and Informational Systems, Education, Communication, and Information Science) and a one-year Master’s course (Education, Clinical Psychology Course). In addition, the Graduate School of Human Sciences has been recognized as a Type I Designated Graduate School where it is possible to obtain “Eligibility for Admission to the Clinical Psychologist Examination” to become a research / clinical psychologist, the only such graduate school at Waseda University. In order to promote the pursuit of fields of specialization studied in Undergraduate School more smoothly, the School of Human Sciences provides a “3-year graduation system” for students. Prospective graduates are able to take an entrance examination for recommendation to the Graduate School of Human Sciences Master’s Program. Career supportWe support your first steps towards the future including career formation and employment support, etc. The term “career” means to design your own life, centered on career options. Currently, when employment styles are becoming progressively more fluid and society as a whole more tumultuous, the attitude of working independently on your own goals and issues is even more necessary. In order for each and every student to carve out their own future, Waseda University provides total support by preparing a wide range of programs. Furthermore, in the School of Human Sciences, we conduct career education in the “Foundation Seminar,” a required subject in 1st year, and also hold undergraduate school explanatory meetings for corporate human resource personnel. 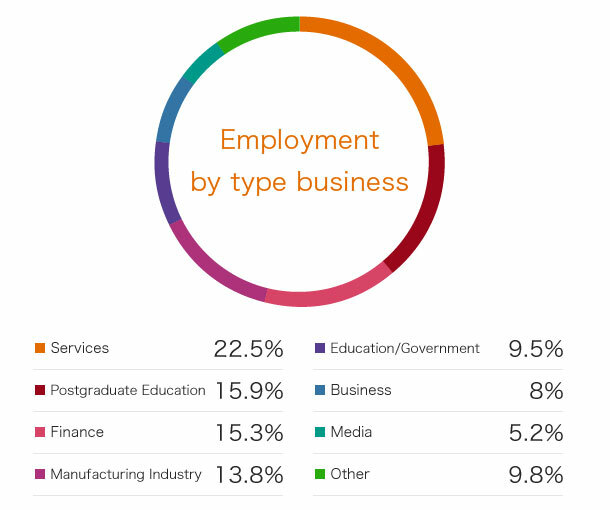 At Waseda University, we aim for career support from a long-term perspective that is not limited simply to supporting job seeking activities. From the time of admission, we provide career formation support including career building seminars and internships, etc., job seeking support such as job seeking guidance and industry study courses, etc., and implement various kinds of guidance and programs centered on information provision, such as career guidebooks and e-mail magazines, etc. Dedicated consultation booths have been established at the Career Center and these are used by more than 7,000 students annually. No booking is required for consultation. Please use these consultation booths positively from your early years at university if you have any anxieties or concerns over the future or employment, however trivial. In addition, in fall, students who have received informal job offers in various industries provide consultations as student career advisors.